Jesse Ross phoned his mother from Chicago on Nov. 20, just to let her know that he was having a blast at the model United Nations conference. He promised to call again the next day when he and the 13 University of Missouri-Kansas City students and their faculty sponsor had loaded the vans for the return drive home. He was that kind of son, said Donna Ross. He always let his mother know where he was, what he was doing, and when to expect him home. He couldn't keep a secret, not from his mother. 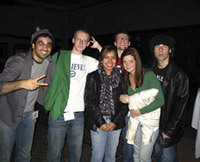 There was an "emergency" meeting of the mock U.N. at 2 a.m. Nov. 21, the final day of the conference that drew more than 1,000 university students from across the country. 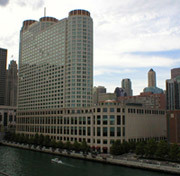 Before the mock emergency, there was a dance, and parties throughout the host Four Points Sheraton Hotel in Chicago's downtown loop. At about 2:30 a.m., about 12 hours after his last cell phone call to his mother, Jesse Ross got up from his chair and walked out of the room for a 30-minute break. A surveillance camera in the hotel lobby caught the unmistakable image of the red-haired Jesse, clad in a white T-shirt, jeans, and a green warm-up jacket, walking toward the main doors. 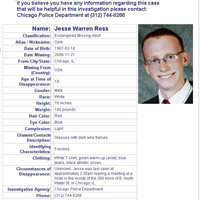 It was the last trace ever of 19-year-old Jesse Ross. The 10-minute walk back to Sheraton Chicago Hotel & Towers, where Jesse and the UMKC group was staying, was well-lit, heavily traveled and covered by outdoor security cameras. None of them recorded Jesse. "Aliens took him away," said his mother, knowing full well how ridiculous that sounds. But it's no more ridiculous than any other reason offered for her son's disappearance. Chicago police have found no evidence that he was a victim of foul play. 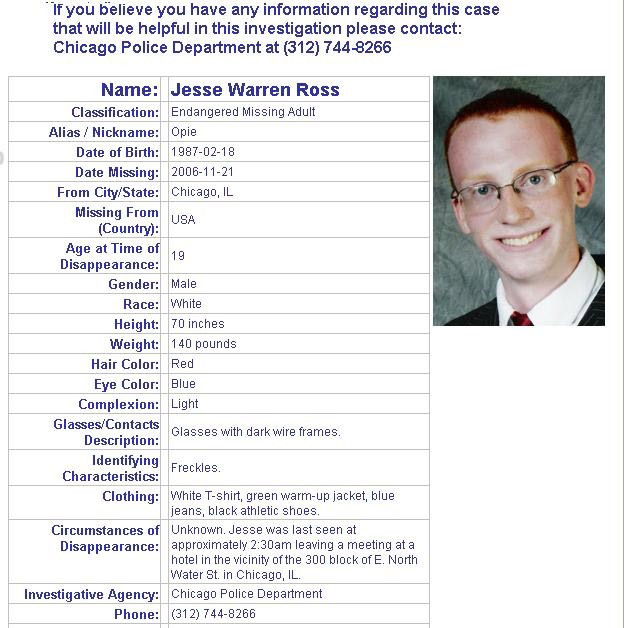 There has been no activity on Jesse's credit cards or his cell phone since he disappeared into the Chicago night. There was no way imaginable to any one who knew him that Jesse could have committed suicide, or wanted to walked away from the life he was living, said Don Ross, his father. Jesse had just gotten a promotion from unpaid intern to paid morning on-air personality at Kansas City radio station 95.7 FM - "The Vibe" - a dream job for a sophomore communications major. "They decided he needed an on-air name, so they named him Opie Cunningham," after Ron Howard's TV characters, Opie Taylor and Richie Cunningham, said Don. A parent's worst nightmare is supposed to be the death of a child. There is a worse nightmare than that, said Don and Donna Ross. "When you lose someone you love when they pass on, you grieve and then you move on with your life," Donna said. "We are nowhere. We are still stuck in that revolving door. We know nothing more than we knew that first day." As the months roll on, Don and Donna Ross can't give up hope. "If Jesse ever thought we'd give up on him, we'd catch hell from him. 'How could you just give up on me?' he would tell us," Donna said.